This is a premier one-of-a-kind concert that will showcase country music at its finest plus stories encompassing 40 years of song writing. 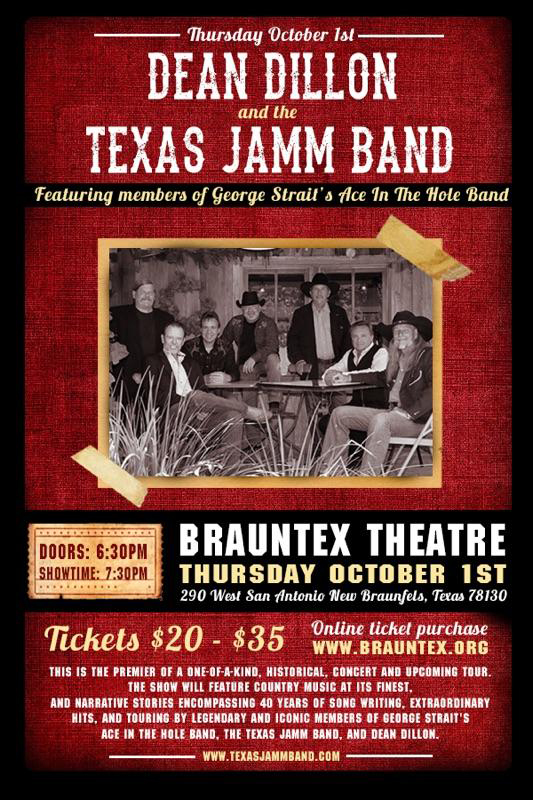 It will feature the legendary and iconic members of George Strait’s Ace In The Hole Band, Texas Jamm Band, and Dean Dillon. Ace In The Hole Band members include Mike Daily, Ronnie Huckaby, Benny McArthur, and Joe Manuel. Texas Jamm Band members include Tom Batts, Dan Dreeben, and Jon Kemppainen. Nashville Songwriter’s Hall of Fame inductee, Dean Dillon, will also join the Band. Dean has written songs for Kenny Chesney, Toby Keith, George Jones, and Keith Whitley, to name a few. Country superstar, George Strait, has recorded over fifty Dean Dillon songs. Please join us for a special evening with these extraordinary musicians. For patron’s needing ADA seating, contact the Box Office at 830-627-0808.